In 1964, Brazil found itself in the eye of the storm. The Cold War – between the superpowers of the United States and the Soviet Union – fanned the flames of conflict in Latin America and in Brazil. In 1959, the Cuban Revolution had made Fidel Castro and Che Guevara international heroes and increased the capitalist bloc’s pressure on countries in the Third World. In Brazil, President João Goulart (Jango) put forward a series of basic reforms to alleviate the serious problem of social inequality as well as the political pressures it was feeling from movements on the left. 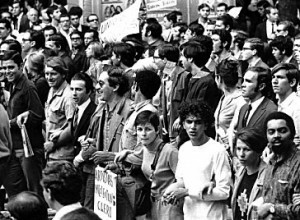 Against these reforms – accused of being communist-inspired – a movement on the political right was formed that included a part of society and preached a conservative modernization. With the support of Congress and the middle and upper classes, this faction won by staging a military coup on March 31st. The army and its civilian allies deposed President Jango and handed over power to the military. The coup, supported by the U.S., destroyed the already fragile Brazilian democratic process. Concentration of income arose as a form of capitalist expansion. Castelo Branco became the first of a series of dictatorial president-generals. His replacement, Costa e Silva, governed the country from 1967 to 1969, with an ever greater concentration of powers. Culturally, the country was in turmoil. Up until 1968, intellectuals and left-wing movements could act freely, with only slight problems with the censors. This intense production ranged from the plays of the Oficina Theater to the Opinião and Arena groups; from protest songs to the pop music of the Jovem Guarda (the Young Generation), and included the movies of the Cinema Novo as well as the visual arts. Politics made its presence felt in all areas, keeping alight in the field of arts a polemic that placed experimentalism in opposition to engagement, participation to alienation. After 1967, the antagonisms became more radical. In music, there was confrontation between nationalist artists and the avant-garde of Tropicalism. The latter were opposed to authoritarianism and social inequality, at the same time proposing an internationalization of culture and a new aesthetic expression, not limited to political discourse. For the Tropicalists, understanding mass culture was as important as understanding the revolutionary masses. Still in the political area, 1968 was the year in which tensions reached a climax in the country. 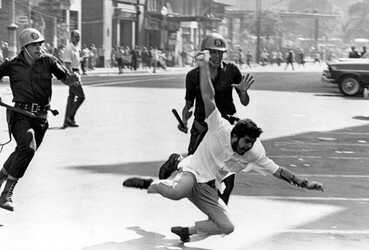 Industrial strikes and student demonstrations – with resulting police repression – intensified. Guerrillas in both the cities and the countryside increased their activity. Faced with growing opposition, Costa e Silva, pressured by the far right, responded with more political repression. On December 13th, Institutional Act Nº 5 decreed the end of civil liberties and freedom of expression, legalizing arbitrariness until 1984, when João Figueiredo, the last of the president generals, left office.